Chuckanut Brewery was just awarded the Small Brewpub of the Year Award and Brewmaster Will Kemper (shown on the right side of the photo above, next to Head Brewer Josh Pfriem) was awarded the Small Brewpub Brewer of the Year Award at the GABF in Denver. They scored Gold medals for their Dunkel and Vienna Lager, and they won Silver medals for their German Pilsner and Schwartzbier. This barely one year-old brewery, located in Bellingham, WA, has been impressing Washington beer drinkers with their lagers, and this win put a smile on many faces across the NW. Will was kind enough to answer a few of my questions after the brewery’s big win in Denver. 1) Chuckanut just won Small Brewpub of the Year at GABF in Denver, and you won the Small Brewpub Brewer of the year award. You have barely been open for over a year; to say that is an amazing accomplishment is an understatement. What was it like being in Denver for the awards? Did a lot of people come by the booth after the results to try the beers? Because of the results the awards were certainly a ball. I must say, I did not expect such good feelings, but it was a blast going up on the stage for all the awards. Yes, quite a few more people came by after the results. There was not a significant flow towards our booth prior. The change is understandable. This was our first year there and hardly anyone knew about us. 2) As a well-established brewer with various accomplishments over the years, how does this rank as far as your lifetime accomplishments in the brewing industry? It was probably the most significant accomplishment in a public sense. However, for most years I was in the background consulting and helping others in brewing. Consequently accomplishments were generally personal. Being allowed to take the first UC Davis Master Brewers Program by correspondence and passing the IoB would probably be up there as well. In that regard I am grateful to my mentor and friend, Prof. Michael Lewis (UC Davis)–the best teacher I have ever had. Considering I have a degree in Chemical Engineering I have seen quite a few teachers. 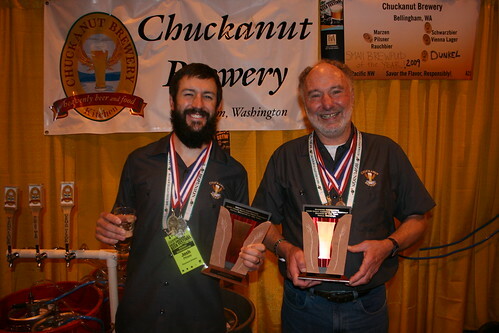 3) All four of the medals that Chuckanut won to claim the Small Brewpub of the Year title were in traditional lager categories, which was a first in the history of GABF. In the current times where many breweries and beer geeks focus on high gravity beers, such as Imperial Stouts and Imperial IPAs, this win was a refreshing change for many. When Chuckanut opened, what made you decide to focus on traditional German lagers and English ales? My feelings on self-appointed beer geeks is probably best left unsaid. The science and understanding of flavor and taste is as involved as any pure science. Being a scientist I respect the fullness and empiricism of that understanding and strive more towards beauty instead of brawn. The choice to brew the styles we do is largely due to the fact that these styles are not brewed so much in the NW anymore. We do want people to experience these in a fresh setting instead of the unfortunate stale beers that are so often attributed to these styles. Beer is incredibly perishable and most people do not fully understand this concept and the implications therein. Finally, in regards to why, I am fortunate to have traveled all over the world for beer’s sake, and good German lagers and English ales are simply wonderful to experience–as are any other good beers. Enjoying beer is obviously one of the reasons I brew for a living. We want to be able to get our beers out to more people. Yes, we have been at capacity since this April so the focus has been to add more tanks. I guess the GABF win simply means a shift in the marketing approach to further enhance our possibilities. Unfortunately, I was not born wealthy and so, being a brewer instead of a better businessperson, has limited our capabilities. Most people think that because I started Thomas Kemper and other breweries, that I have deep pockets. However, I received virtually nothing from Thomas Kemper and it has taken several years to simply get the resources to start our small brewery in Bellingham. 5) Your brewing career has taken you to many different parts of the globe. When did you decide that you would be returning to Washington to open a brewpub, and how has your experience been with the Washington brewing industry this time around after all these years? Was there a driving factor that made you want to return to Washington in particular? We actually have had a house in Bellingham (Chuckanut Drive) since the 1990s. In the 1990s and around 2000 we tried to get the brewery going there, but it never came together. Circumstances were such that I was then called away on a brewery consulting project(s) and everything was put on hold in Bellingham. So, in essence, we have been planning our brewery in Bellingham since the 1990s. However, when it never materialized I had to go elsewhere to make a living, and we simply rented our house. The brewing industry people here are (generally) wonderful to be around, and we are glad to be a part of it again after 20 years. The driving factor for returning to Washington to do this is that we finally got enough money to get it started and it happened. Thanks again to Will, Josh, Mari, Annie, and the rest of the team at Chuckanut for revitalizing our thirst for quality lagers here in the NW! Kemper is anti-douche! That quote makes me think more highly of Mr. Kemper…and Chuckanut’s tasty lagers already had me thinking pretty highly of him. Great questions. It cleared up misconceptions I had about him having a bundle of money from Thomas Kemper and using it to start Chuckanut. He’s doing some great beers up there and I’m glad to see them honored at the GABF for their work. But I am trying hard not to be offended at the way all “self-appointed beer geeks” get a slam in this piece – How can so many varied persons be tarred with a single brush? That said, I do blame the question as much as anything, and hope I correctly understand the intent behind the answer. Does this somehow make me a bad person? I don’t believe so. And I hope that Will would not, on reflection, think so either. As to your jumping on the band-wagon comment, Mr. “Beer Retard” – who are _you_ to call _me_ douche? Tracey–I didn’t call you a douche. I wouldn’t do that unless I’d met you and thought you were one. But since I don’t know you…. I just took what Mr. Kemper said to mean that he’s had dealings with some of those uber-snobby beer douches that take the fun out of beer for the rest of us. I’m thinking those are the kind of people he’s going to leave his opinion of unsaid. I commend him for keeping his thoughts to himself. I seem to be unable to do that.